St George is England’s patron saint – and Catalonia’s. April 23, his day is traditionally when Catalans celebrate all kinds of love, by giving red roses, as St George is supposed to have given one to the princess he saved from the dragon. Shakespeare and Cervantes also both died 399 years ago today. 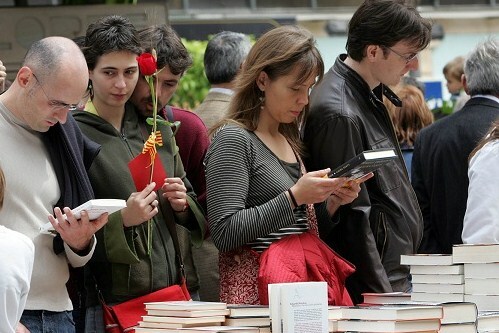 A Catalan bookseller, Vicente Clavel, noticed their shared anniversary in the 1920s, and turned Sant Jordi into the day of giving books as well as roses. The streets of Catalan towns and cities turn into one big book fair today. UNESCO got on the bandwagon in 1995 and today became World Day of Book and Copyright. This year’s theme is getting access to books on mobile devices: In Nigeria for example, there is only 1 library for 1.3m people, but almost 90% of people have a mobile phone. Another priority is access to books in different languages. So where can you find Shakespeare and Cervantes translated into each others’ languages online? You can read some of the earliest translations of Shakespeare’s sonnets into Spanish, from Matías de Velasco y Rojas onwards, as “rescued” by Ángel-Luis Pujante, and search the database of the Shakespeare in Spain project for translations of his plays and more. There are several translations of Cervantes’ Don Quixote into English to choose from. The earliest, The delightfull history of the wittie knight, Don Quiskote by Thomas Shelton, appeared in 1611, before Cervantes’ own second edition.